The Southern Cross points (more or less) to the South Celestial Pole, an imaginary spot around which the whole of the southern sky appears to rotate. Having found it, you just drop your hand straight down to the horizon and you’ll be pointing south. If you walk south far enough, the South Celestial Pole will eventually be directly overhead of where you are—at which point you will be standing on the South Geographic Pole (and be feeling a bit chilly). As you can see below, the rotation of the Earth makes the stars appear to rotate clockwise around the South Celestial Pole. Throughout the year the position of the Celestial Pole never changes, but the position of the stars appear to gradually advance to the west. Each night they should reach the same point in the sky about 4 minutes earlier than they did the previous night. For example at around 7pm (EST) in December, Orion’s Belt appears in the Eastern sky, in March it’s about midway. By June at 7pm its moved right across to the west about to set. After June you don’t get to see it again at that time of night until December comes again. About this time another recognizable constellation Scorpius appears to dominate the winter and spring skies. 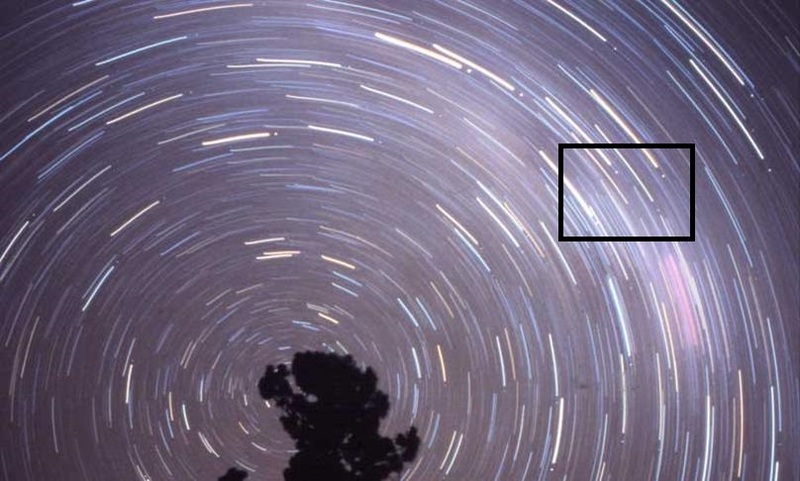 A star trails photo directed at the south celestial pole shows how the long axis of the Southern Cross (in box) always points to the Southern Celestial Pole. The Pole can be found by drawing another line perpendicular from the mid-point of the two ‘Pointers’, Alpha and Beta Centauri, in the oval shape. Alpha Centauri is always furthest from the Southern Cross and to the left in this photo. The pinkish haze below the box is the trail of the Carinae nebula.